Protein is key to good health -- it's involved in immune function, oxygen transport and maintaining strong muscle tissue. "Crude protein" is a measure of how much protein is in food, based on laboratory tests studying the food's chemical composition. When you look for protein content on a food's nutrition label, the number you see refers to crude protein. There are two measurements for the protein in food: crude protein and true protein. Crude protein is calculated after measuring the nitrogen content of a food. Because each amino acid -- the building block used to make protein -- contains nitrogen, looking at the total nitrogen content of a food gives some insight into its protein content. However, because not all of the nitrogen in food is found in protein, using crude protein as a measurement might inflate the amount of protein in a food. True protein, on the other hand, is calculated after directly testing for the level of protein in food, so it offers more accurate insight into how much protein you'll get per serving. The protein content on nutrition labels is determined via testing for crude protein, not true protein. That means that the protein content on the nutrition label could theoretically slightly overestimate the amount of protein actually found in the food -- for example, in dairy, according to Cornell University. Because food manufacturers use crude protein content to calculate the amount of carbohydrate in food, any inaccuracies in the protein content could potentially cause inaccuracies in the carb content as well. 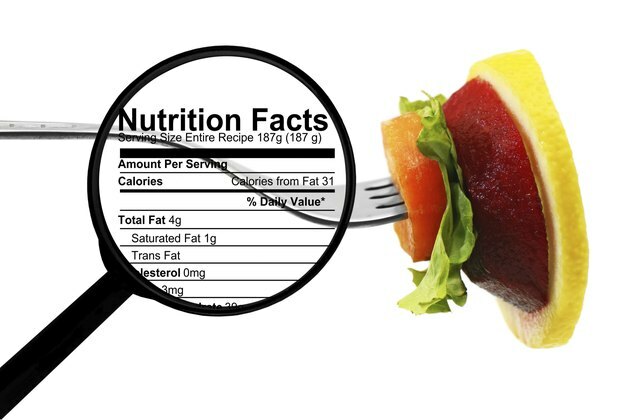 There's some evidence that the facts listed on menus don't accurately report the actual nutrient -- including protein -- content of the food. One study, published in Appetite in 2015, found that the actual protein content of restaurant food offered on a college campus differed significantly from the nutrition info posted on the menu. In addition, the real protein content of milk can differ from the amount of crude protein, according to a report from Cornell University. This difference can have a significant effect on making dairy products, like cheese, notes the report. Don't get too stressed out about whether nutrition labels measure crude protein or true protein, or if some labels don't completely accurately report protein content. The fact is, most people easily get all the protein they need from diet, according to the University of Massachusetts, so you likely don't need to worry about your protein intake. Make sure you're getting your protein from healthy sources. Plant-based foods, like beans and nuts, offer lean protein as well as heart-healthy fiber, while lean animal-based proteins -- like low-fat dairy, poultry and fish -- provide lots of protein without a lot of saturated fat.